Answer: Solomon’s advice to parents is to “train a child in the way he should go, and when he is old he will not turn from it” (Proverbs 22:6). Raising and training a child within the context of this proverb means that it begins with the Bible, as “all Scripture is God-breathed and is useful for teaching, rebuking, correcting and training…” (2 Timothy 3:16). Teaching children the truths of Scripture will make them wise for salvation (2 Timothy 3:15); thoroughly equip them to do good works (2 Timothy 3:17); prepare them to give an answer to everyone who asks them the reason for their hope (1 Peter 3:15); and prepare them to withstand the onslaught of cultures bent on indoctrinating young people with secular values. 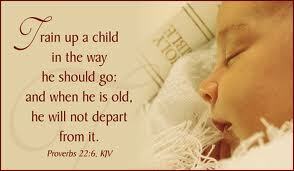 The Bible tells us that children are a reward from God (Psalm 127:3). It would certainly seem fitting, then, that we heed Solomon’s wise counsel to train them appropriately. In fact, the value that God placed on teaching our children the truth is clearly addressed by Moses who stressed to his people the importance of teaching their children about the Lord and His commands and laws: “Impress them on your children. Talk about them when you sit at home and when you walk along the road, when you lie down and when you get up. Tie them as symbols on your hands and bind them on your foreheads. Write them on the doorframes of your houses and your gates” (Deuteronomy 6:7-9). Moses’ thoroughness underscores his deep concern that successive generations maintain obedience to God’s laws to ensure they would “live safely in the land” (Leviticus 25:18), that all would “go well” with them (Deuteronomy 12:28), and that He would bless them in the land (Deuteronomy 30:16). Clearly Scripture teaches that training children to know and obey God is the basis for pleasing Him and living victoriously in His grace. Knowing God and His truths begins with the child’s understanding of sin and his need for a Savior. Even very young children understand that they are not perfect and can grasp at an early age the need for forgiveness. Loving parents model a loving God who not only forgives, but provides the perfect sacrifice for sin in Jesus Christ. Training up children in the way they should go means, first and foremost, directing them to the Savior. Discipline is an integral part of raising godly children, for we know that the “LORD disciplines those He loves” (Proverbs 3:12). Thus, we should neither take discipline lightly nor become disheartened by it as the Lord “punishes everyone He accepts as a son” (Hebrews 12:5-6). And we know that God disciplines us for our good, so that we may share in His holiness (Hebrews 12:10). Likewise, when we discipline our children, they receive wisdom (Proverbs 29:15) and they will bring us peace (Proverbs 29:17) and respect (Hebrew 12:9). In fact, even at a tender age children are able to discern that discipline is rooted in love. That is why children who grow up in homes without discipline often feel unloved and are more likely to disobey authority as they grow older. Now, the discipline administered should be commensurate with the offense and physical discipline, such as spanking (rightly motivated), is certainly condoned by the Bible (Proverbs 13:24, 22:15,23:13-14). Indeed discipline, though it may seem unpleasant when received, will produce a “harvest of righteousness and peace for those who have been trained by it” (Hebrews 12:11).